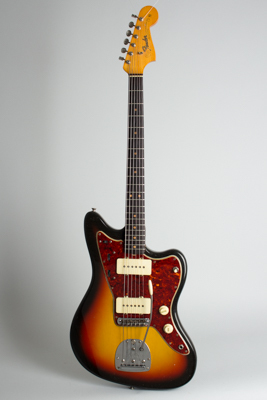 Fender Jazzmaster Model Solid Body Electric Guitar (1965), made in Fullerton, California, serial # L-70616, sunburst lacquer finish, alder body, maple neck with rosewood fingerboard, black tolex hard shell case. This is an early CBS Fender Jazzmaster with a difference: the very rarely ordered "A" neck, which is an extra-slim 1 1/2" wide at the nut. This narrow nut width was standard on the Jazz Bass and (for some inexplicable reason) the Bass VI, but only available as a special order item on any other Fender instrument. This solidly pre-CBS neck is date-stamped February 1964 with the unbound rosewood fingerboard and "clay" dots in use at that time. Why, then, are we dating this guitar as a 1965? That's an example of some typical quirks of Fender production; the "A" neck was not a popular item at the time, and a batch of them made up in February 1964 would have sat in stock, only fitted to a guitar when a dealer order came in. This guitar looks to have been assembled and sold in early 1965 -- the pickups carry a handwritten date of February that year. The appointments show a mix of features including the "tighter" sunburst finish with a large yellow center and starker color blending typical of 1965. The pickguard however is a late example of the original tortoise pattern nitrocellulose, which was being replaced right at this time by ABS plastic. The neckplate shows a late example of the 1963-5 style "L" number, typical of this period, and this is a "transition" guitar in every way, still made up of all Pre-CBS pattern parts. For experienced Fender players the very slim neck feels odd at first, but is still very comfortable unless you have particularly large fingers. This is a very rare and fine-sounding and playing Jazzmaster; if you've been looking for an "A", this is your baby, and it's worth a try even if you're usually a "B" player! Overall length is 41 in. (104.1 cm. ), 14 in. (35.6 cm.) wide at lower bout, and 1 1/2 in. (3.8 cm.) in depth, measured at side of rim. Scale length is 25 1/2 in. (648 mm.). Width of nut is 1 1/2 in. (38 mm.). This is a very clean guitar overall with some minor playwear but overall completely original and unaltered. The neck is worn down to the wood a decent percentage on the back, and there is one scrape to the headstock decal on the big "F". The body finish has small dings and dents but is mostly very clean, partially due to a Fender "Bodyguard" (by Parker) that was fitted originally. There are polished out spots on the body edges where this foam-edged plastic piece was in prolonged contact with the finish, but this guitar is far less scarred by this interaction than many. The original frets show some light wear in the lower positions, but the guitar plays very well, and once one gets used to the slim profile neck is a real hot rod. It is currently housed in an original 1966 Fender case for an Electric XII model, which looks the same and works fine although it is just a bit longer than the stock Jazzmaster case. Excellent Condition.